Background Effective prescription medications are available to treat menopausal symptoms. However, due to adverse effects and risks associated with use, many women are seeking complementary and alternative options to treat their symptoms. Nonpharmacological options for the management of menopausal symptoms are widely available and frequently used. 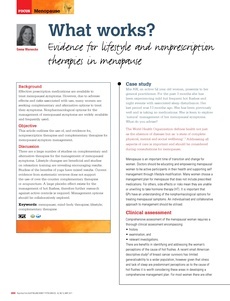 Objective This article outlines the use of, and evidence for, nonprescription therapies and complementary therapies for menopausal symptom management. Discussion There are a large number of studies on complementary and alternative therapies for the management of menopausal symptoms. Lifestyle changes are beneficial and studies on relaxation training are revealing encouraging results. Studies of the benefits of yoga have mixed results. Current evidence from systematic reviews does not support the use of over-the-counter complementary therapies or acupuncture. A large placebo effect exists for the management of hot flushes, therefore further research against active controls is required. Management options should be collaboratively explored.